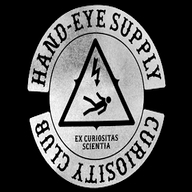 The Hand-Eye Supply Curiosity Club meets fortnightly on Tuesdays from 5:30 to 6:30 PST. Each meeting of the Hand-Eye Curiosity Club will contain a 18-28 minute lecture from a speaker who has an area of knowledge that appeals to the curiosity club. The presentation will be video recorded and streamed along with any presentation materials the speaker brings e.g. power point, pages, etc.